If a dog has been inside a lot during the winter and has had little exercise, his muscles are probably a little bit stiff. Just like with people. With the difference being that we feel it when we need to take a rest, but a playful dog might just want to continue. Build up the walks step by step and avoid wild games in the first few weeks so to prevent potential injuries. Also a dog swaps his warm winter jacket for something lighter in spring. All dogs shed, although you might hardly notice it with a certain breed, while another breed leaves plucking everywhere. Brushing the hair every day and then wiping the fur with a damp cloth stimulates the molting and prevents dead hair from tangling together. When the weather gets warmer, different types of parasites will also start appearing again. Ticks, lice, fleas and worms thrive in a warm, moist environment. In a timely fashion, think about the annual vaccinations and purchase good protective products. You do not have time to go for walks, or for some reason you are not able to give your dog enough exercise outside? Then this is the right moment to install a dog flap. Especially when a dog often has to stay home alone, it might be a good solution if he could go into the garden by himself. In spring and summer, the need is certainly stronger compared to those bleak winter months, and it will help your dog to stay active and happy. Provide outdoor toys, this might stop the dog from digging in the garden. Orange peels can also help. 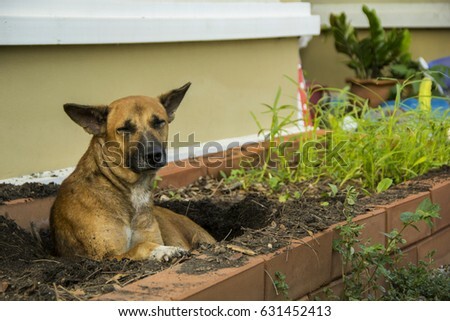 Place them in places where you definitely do not want your dog to dig, because most dogs hate the smell of citrus fruits. If your dog has a tendency to eat plants, then it is better to avoid some species. A few species that are toxic to dogs: azalea, oleander, rhododendron, foxglove, and, unfortunately also beautiful flowers as daffodils, hyacinths and tulips.